Kashi Yatra is a Hindu pre-wedding ceremony at the groom’s end. It generally takes place in the morning, on the day of the wedding, after the Snatakam or the thread ceremony. In some communities, Kashi Yatra takes place after the holy bath or Mangala Snanam. Post the recitation of Vedic verses for Snatakam or the thread ceremony, the groom pretends to leave for Kashi to take up Sainthood. He carries a walking stick, an old umbrella, a bamboo fan, an old slipper and other essentials required for the pilgrimage, which indicates that he is not interested in any worldly pleasures. The groom is convinced by the bride’s father or brother that the bride would assist him in his spiritual pursuit and requests him to take up the responsibility of leading a happy married life. 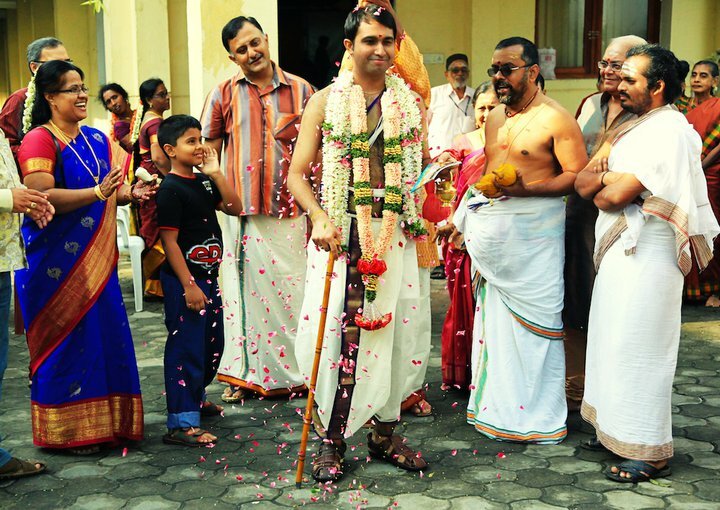 As a bachelor, the groom would have the mindset to escape from the challenges of life and to lead a simple spiritual life. When the bride’s father convinces him saying that he would give his daughter to him and and she will be at his side to assist him in overcoming the challenges of life, the groom would take his advice and would agree to get married. The umbrella will remain with the groom always and will remind him of the advices given during this ceremony.